Would the young person you support like to join others to make a difference? Envision, RNIB’s young people's campaigns network, is run by and for blind and partially sighted campaigners aged between 18 and 30 in England. 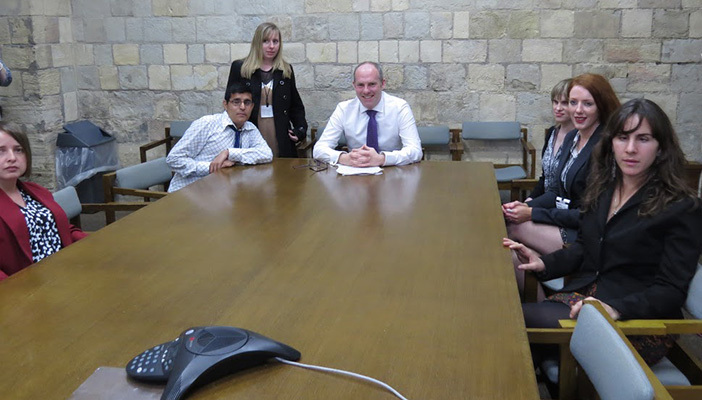 In October members of Envision had a rare opportunity to visit Parliament. They had a tactile tour of the House of Lords, watched Prime Minister’s Questions and met MPs and their researchers and members of the press. A delegation also met the Minister for Disabled People to explain the challenges they face accessing employment and specifically, the Access to Work scheme, calling on him to remove barriers preventing them from working. Speaking of the visit to Parliament, Envision member Kirsten Robson could barely contain her excitement, she told us, "Wednesday 14th October was THE day. The day I got to go to Parliament! I had definitely dreamt about this for some time, and I was very excited that it had eventually arrived. It was even more exciting that the reason I was going to be there was to campaign for something that will directly affect me." The event followed a day’s training on campaign skills, the role of Parliament and influencing MPs. "The training day was an invaluable experience as it put in place the basis for our communications within Parliament the next day,” Kirsten said. "All-in-all the two days were very valuable and worthwhile. I am really excited about where this campaign will lead, and what changes will hopefully come about because of it." The network provides an opportunity for like minded young people to get together and campaign on the issues that affect them. Campaigns are decided upon, organised and run by members, led by their elected steering group and with support from RNIB. Members of Envision are passionate about being able to live independently and see the ability to get out and about, and to work as central to this. If a young person you work with is aged between 18 and 30, blind or partially sighted and passionate about achieving change please share this news story with them and encourage them to email [email protected] to find out how they can get involved. They can also follow Envision on Twitter @envisionengland or join us on Facebook.